The Kittens are now two weeks old and their eyes are open. They are moving away from crawling to taking their first steps. It’s more difficult than it looks because it’s a balancing act involving four paws and a large head. When they take each step they wobble, and it’s hard to believe that by next week they’ll be walking with confidence. Here is a video of the Kittens at Play. 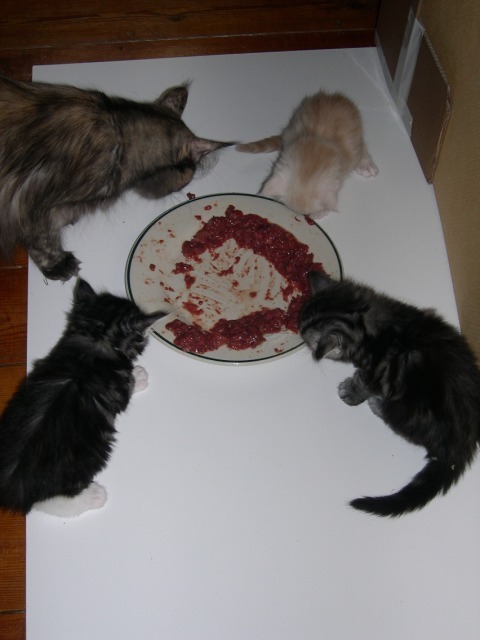 I wrote yesterday about the feeding frenzy as newborn kittens jostle to establish their teat supremacy. Imagine what it must be like: you’re a newborn kitten, you can’t see anything, you’re in a space filled with bolster-like objects that jostle and hurtle into you and turn you round and round so you don’t know where you’re going. In the meantime, you’re starving but every time you find some yummy milk, someone else is there. No wonder kittens get so desperate! Here are some short clips I took this morning to show you just how energetic the kittens can be at feeding time. They were taken in low-light conditions, so the film is a bit grainy, but I didn’t want to use artificial lighting in case it disturbed the kittens. This is a video clip: Kitten Teat Wars – Part 1. 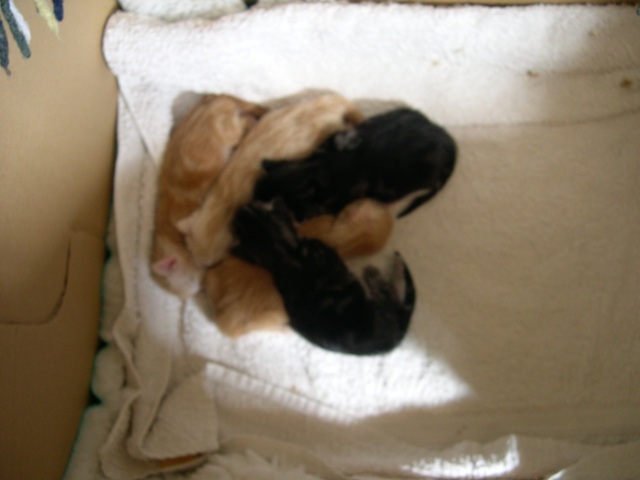 A cream kitten and a ginger kitten square it off over a teat. It looks like ginger has got its teat, but find out what hppens in the exciting conclusion, Kitten Teat Wars – Part 2. Here’s the sequel: Kitten Teat Wars – Part 2. The cream kitten’s got an impressive left-paw. Will it stand it in good stead? Will he get the teat? As you may know, my queen, Ananda is pregnant, and hopefully the stork will be visiting soon. She was very restless last night and this morning. I woke up several times to rub her tummy for comfort. Here are some cat pregnancy sites which I have found useful. The first time she kittened, I didn’t have anyone experienced to help me, just what I found on the internet. All I can say is … I was lucky, it went smoothly, and thank goodness for the www. 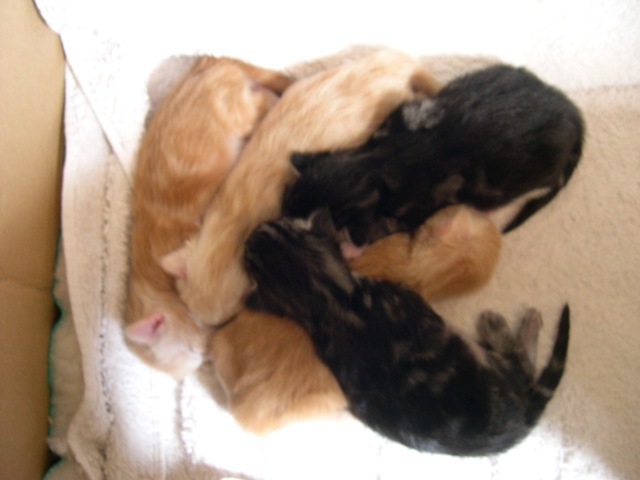 Feline Advisory Bureau’s “Feline Parturition – When to wait and when to worry” – explains the different stages of pregnancy, has photos of a cat giving birth, discusses interrupted labour, possible encountered during labour, what you can do to help and methods of kitten revival. About.com’s “So your Cat is Pregnant” – a series of articles on the birth process and possible complications. PetEducation.com’s “Queening (Giving Birth)” – has a handy list of what supplies you need for the birth, also a sample table for recording kitten weights. One thing missed on the list is a torch – this is very handy if you wake up in the middle of the night and want to look at kittens without switching on the main light. Rameses Cat’s “Ellie’s Kittens” – day-by-day progress report on Ellie, a Siamese cat, from birth to when the kittens leave home. Fantastic photos and narrative. 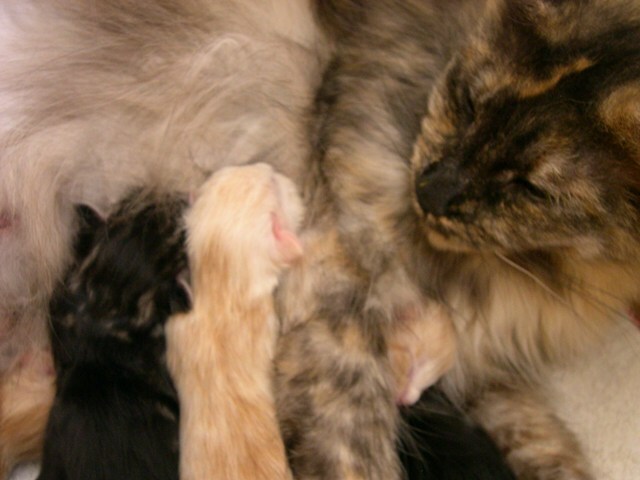 Also check out Libby’s Kittens on the same site. Finally, expert advice from the people who’ve been there and done that on the Novice Breeders Advice Forum. As cat breeders keep strange hours, you can count on almost 24/7 advice on this Yahoo Groups forum. You will have to register before participating, so best to join the group well before your queen is due. Really warm and generous group.